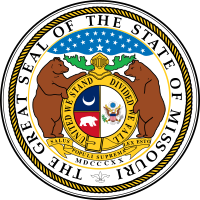 The Great Seal of the State of Missouri was adopted on January 11, 1822. Judge Robert William Wells designed the seal. The center of the seal contains the Great Seal of the United States on the right side, and, on the left, symbols representing the state. On both sides of the center circle, a bear represents strength and bravery; a crescent moon represents the newness of statehood and the potential for growth. Surrounding these symbols is the motto "United we stand, divided we fall". The belt buckle signifies the State's ability to secede from the Union if deemed necessary, i.e., the belt can be unbuckled. Two mighty grizzly bears support this center shield. A scroll carries the state motto, Salus populi suprema lex esto, a Latin phrase meaning "Let the welfare of the people be the supreme law." The year 1820 is inscribed in Roman numerals below the scroll, although Missouri was not officially granted statehood until 1821. A star representing each of the other states of the Union (Missouri became the 24th) graces the top portion of the seal. The outer circle of the seal bears the words "The Great Seal of the State of Missouri". Above the shield is a helmet representing Missouri's state sovereignty. The large star above the helmet surrounded by 23 smaller stars represents Missouri's status as the 24th state. The cloud around the stars indicates the problems Missouri had in becoming a state. Salus populi suprema lex esto (Latin "Let the good of the people be the supreme law" or "The welfare of the people shall be the supreme law") is found in Cicero's De Legibus (book III, part III, sub. VIII), as Ollis salus populi suprema lex esto. The phrase is the state motto of Missouri, accepted in its state seal. It is also the motto, and appears on the coat of arms, of the City of Salford, the London Borough of Lewisham, the Duquesne University School of Law, and is used as the motto of the Vlaams Belang political group in the Belgian Chamber of Representatives. John Locke uses it as the epigraph in his Second Treatise on Government and refers to it as a fundamental rule for government. ^ "The Missouri State Flag". State of Missouri. Netstates.com. Retrieved 2011-09-21.